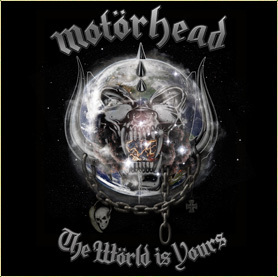 Motorhead - "The World is Yours"
So pretty much every 2 years we get a new Motorhead record, which is cool. I bought the limited edition Motorhead classic rock issue which came with the CD, a full size poster and a metal Motorhead monster pin. The mag is all Motorhead, with interviews with Lemmy (multiple), Phil and Micky Dee. One long-time fan goes through all the album covers and they have some reviews of all the records and more stuff. It was fun to read. As for the new record, it is 10 tracks in 39 minutes and straight up, no fuckng around Motorhead. The band has their formula now, especially since working with Cameron Webb (the producer) and stick to it, just like AC/DC. No ballads on this rocking mother though. As all of the last many Motorhead records, there are the stand out tracks and the pretty much catchy, you won’t remember this track, rock songs.